More stoles and stories: red Ordination stole – and purple too! 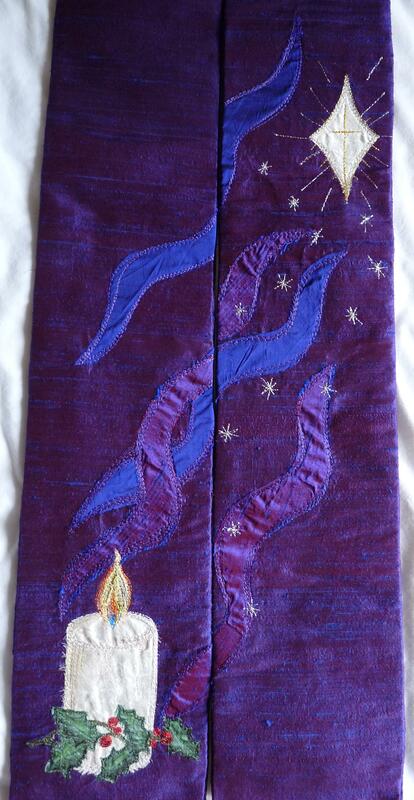 Some while back I took delivery of what I thought would be my ordination (white – Christmas/Easter/Weddings) stole and the green (‘ordinary time’) stole, and now my stole maker has completed the red (Pentecost and Saints Days) and Purple (Advent and Lent) ones. During the intervening time the red one has in fact become my ordination stole after the new Precentor and our Bishop came up with the change of plan in the middle of our Deacon’s Day! Once again I am totally thrilled with the way that Deborah Ireland has turned my scribbled notes and photographs, along with snippets of significant material including more bits of my wedding dress, into the most amazing creations which will mean I carry the stories of my faith journey and some special people into my ordained ministry. The red stole is all about the Holy Spirit – Pentecost being a deeply significant time for me, and if it wasn’t for the prompting of the Holy Spirit (both in my life, and in the lives of others who nudged me into getting my head round the possibility of a calling to ordination) I wouldn’t be just over two weeks from ordination – interview with my Bishop next week permitting! 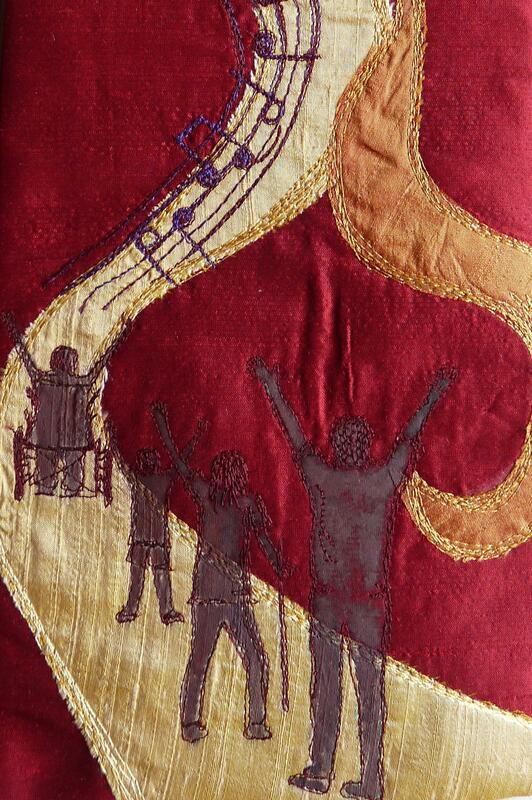 Hidden in the stitchwork is the music for a favourite chorus that will make some cringe, but is one that can move me to tears and remind me of my baptism in the Spirit at St. Mike’s in Aberystwyth (Pentecost 1988) as well as many years of leading or singing in worship bands. I’ll let you guess what it might be! Pentecost was also about the people of God being enabled to do more than they could possibly imagine through the power of the Spirit at work in them – so there’s people there too, and though I didn’t design it with this in mind, everytime I look at one of the characters I think of my mother. 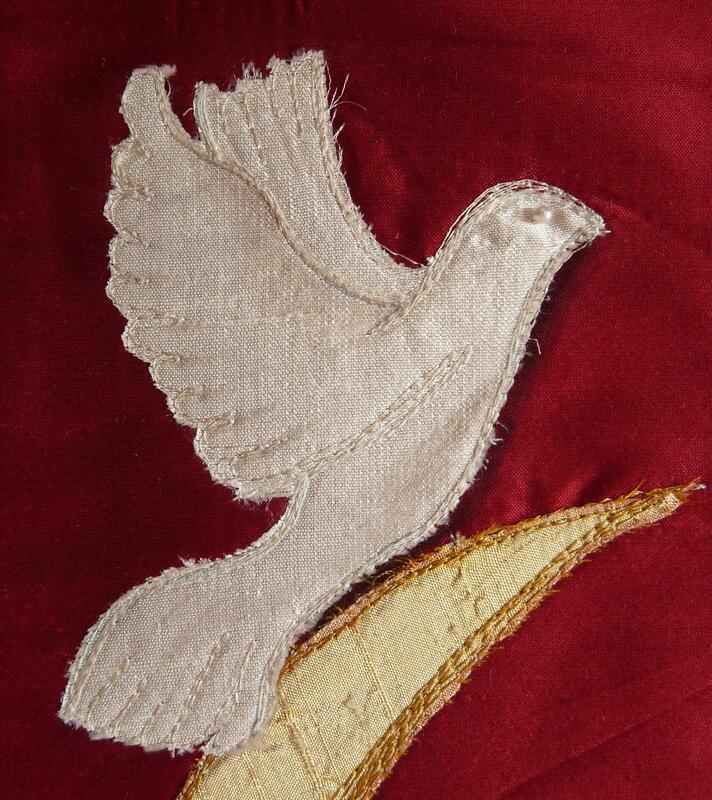 The dove of peace is a bit of wedding dress, with one of the beads off the same to make it’s eye! My purple stole is double sided and it’s probably easy to spot the bits of wedding dress; losely speaking Advent and Lent. From an early age flower arranging was part of life (or at least sweep up after my Mothers’ church flower arrangements was), so as well as the symbolism of anticipating the light of Christ coming into the world, there’s a slight nod in that direction on the Advent side. There are also stars – something are both a significant interest of my husband and some very long-standing friends as well as being a reminder of the need to follow Christ faithfully even when we can’t really see where he’s leading us! The Lenten side used as its inspiration not only the crown of thorns placed on Christ’s head at the crucifixion but also the nails themselves – designed from a photo of some hand-made ‘crucifixion’ nails my Dad had made by a New Forest blacksmith a couple of years ago. Those familiar with the “Water Bugs and Dragonflies” book for explaining death to young people will understand why I wanted one on a stole I might well wear to take funerals – over and above the fact that they’re a big photographic passion of my husband and I. We are really impressed at the lifelike markings Deborah has created on this Common Darter that we photographed together with my Dad in a favourite place in the New Forest a couple of years ago (see below). The dragonfly’s wings are made of net from the petticoat of my wedding dress, and some of the material is taken from a gift received many years ago from a Nigerian Catholic nun aquaintance… I hope she appreciates the use I’ve put it too. That’s me all set up with vestments then. I look forward to wearing them as reminders of so much of the past, but also the importance of making best use of past experiences and interests in my future ministry, such that God is glorified. 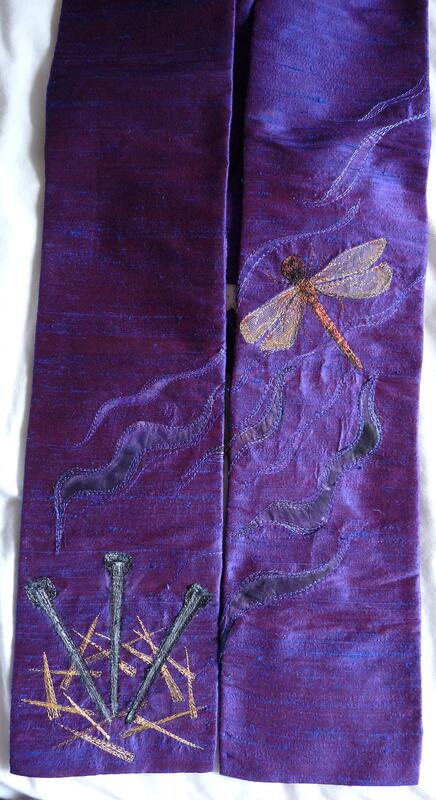 Detail of the dragonfly on my Lenten stole.